Pemko manufactures durable high quality rigid weatherstrip products that meet or exceed customer specifications. This line of door bottoms is designed for heavier duty applications. 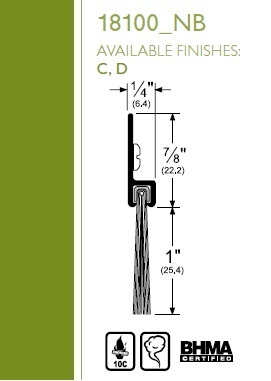 Pemko's Brush Gasketing consists of dense type 6 nylon bristles which will conform to irregular surfaces irregular surfaces making it an excellent product to seal almost any opening using a minimal closing force. Brush Door Sweeps are designed to seal the gap between the bottom of the door and the top of the threshold or floor surface. They are supplied with a flat flange that provides the best contact between the brush and the threshold or floor surface. All clear anodized brush products are supplied with gray brush. All brush seals consist of densely compressed nylon filaments encased in high quality aluminum retainers. These products are ideally suited for hollow metal and wood door (in-door sweep, jamb/header gasketing, and split astragal) applications. All brush seals greatly reduce the infiltration of light, air, wind, rain, and snow; prevent heat loss; control the penetration of smoke and fumes. The dense nylon filaments conform to the contours of every sealing surface, providing a superior seal with extremely low closing force. Brush remains flexible down to -40°F and has a melting point above 400°F. Nylon brush insert is designated by a undefinedNBundefined following the finish code. All brush seals come with #6 x 5/8" stainless steel sheet metal screws. Punched with slotted holes for adjustment (except 35° angle types which are drilled with 1/8" hole).